JERUSALEM (AP) — Israeli firefighters on Friday reined in a blaze that had spread across the country’s third-largest city of Haifa and forced tens of thousands of people to flee their homes, but continued to battle more than a dozen other fires around the country for the fourth day in a row. The over 60,000 Israelis evacuated began returning to their charred homes to assess the damage as police and firefighting units remained heavily deployed in the Haifa area for fear that the fires could be reignited due to the dry, windy weather. Though no deaths or serious injuries have been reported, several dozen people have been hospitalized for smoke inhalation. Hundreds of homes were damaged and in a rare move, Israel called up military reservists to join overstretched police and firefighters and made use of an international fleet of firefighting aircraft sent by several countries. A Boeing 747-400 Supertanker, the world’s largest fire-fighting aircraft capable of carrying 75 tons of fire retardant, is scheduled to arrive later Friday to help the efforts, though officials said it may not be needed by then. Police spokesman Micky Rosenfeld said a small village in the forests near Jerusalem was evacuated overnight as several homes there caught fire. Other small fires were under control, he added. Later Friday, a large fire swept toward the village of Nataf on the outskirts of Jerusalem, causing authorities to evacuate all of its residents. Local witnesses say the blaze was caused by a firebomb hurled from a neighboring Arab village. Overall, Rosenfeld said 12 people have been arrested across Israel on suspicion of arson. 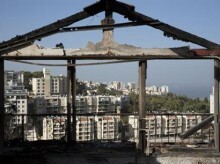 The country’s leaders have raised the possibility that Arab assailants had intentionally set the blazes. Israel has been on edge during more than a year of Palestinian attacks — mostly stabbings — that have tapered off but not completely halted in recent months. Prime Minister Benjamin Netanyahu has blamed Palestinian incitement for fueling those attacks and echoed the charge, pointing to celebrations in some Arab circles over the fires. Netanyahu said investigators are working overtime to apprehend anyone involved in setting off fires. Israel’s police chief Roni Alsheich told reporters Thursday that early indications pointed toward a series of “politically motivated” arson attacks. The fires began three days ago at the Neve Shalom community near Jerusalem where Israelis and Arabs live together. Later, blazes erupted in the northern Israeli area of Zichron Yaakov and elsewhere near Jerusalem before the largest ones spread across Haifa. The rash of fires is the worst since 2010, when Israel suffered the single deadliest wildfire in its history. That blaze burned out of control for four days, killed 42 people and was extinguished only after firefighting aircraft arrived from as far away as the United States. Israel has strengthened its firefighting capabilities since then, buying special planes that can drop large quantities of water on affected areas. Several countries, including Russia, France, Cyprus, Turkey, Croatia, Greece and Italy were also sending assistance to battle this week’s blazes. In a rare gesture, the Palestinians also sent firefighting teams to help combat the flames. With the imminent danger subsiding, attention shifted toward the source of the massive fires. The police chief has ordered an investigation to determine whether the suspected arsonists were linked to a larger plot. Several ministers and lawmakers have already spoken up, alleging that the blazes were an act of terrorism. The rhetoric could test already brittle relations between Israel’s Jewish majority and its Arab minority, which has long suffered discrimination in Israel. With no concrete evidence to support the claim, Arabs are accusing the government of taking advantage of the tragedy to incite against them.